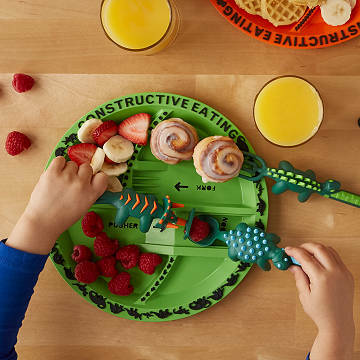 With a dino spoon, fork, and pusher, little eaters will always be excited to clean their plate. Welcome to the Cute-aceous Period, where little eaters can have brontosaurus-sized fun eating every last bite. With a dino spoon, fork, and pusher, they’ll always be excited to clean their plate. Designed with function and imagination in mind, the utensils feature textured, easy-to-grip handles and are lightweight yet durable. Designed by a husband-and-wife team and made in the US. Plate and utensils are sold separately. Please make sure you have the correct items in your cart at checkout.